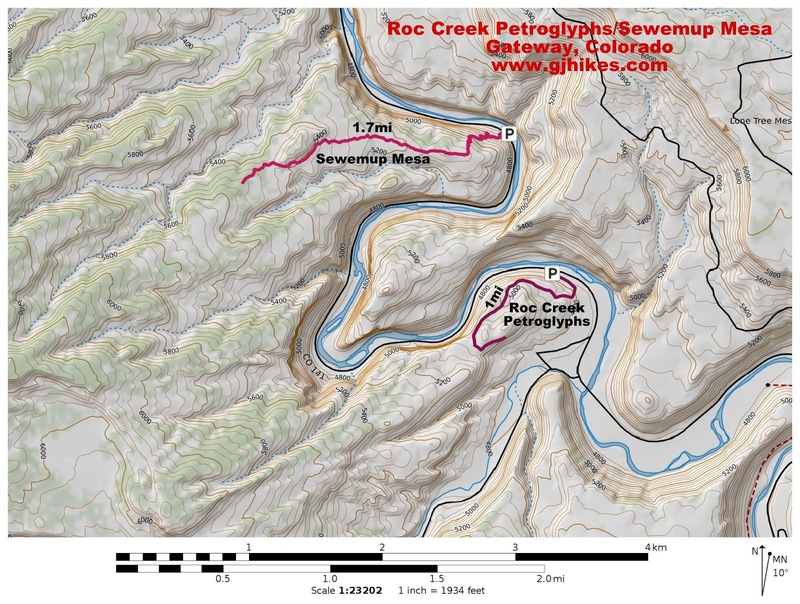 The Roc Creek Petroglyphs trail is located just off of Highway 141 between the towns of Gateway and Naturita, Colorado. 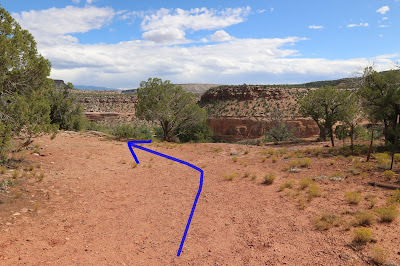 The trail follows an abandoned jeep road up to a ridge where a singletrack trail continues for several hundred feet to an overhang that sits above the valley below. 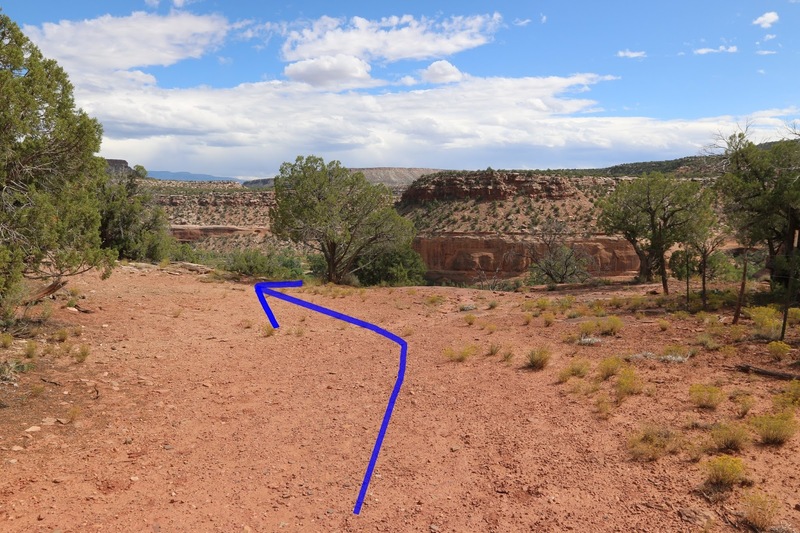 Part of the trail crosses private property but according to the website the West End Trail Alliance the BLM has secured the proper permission from the landowner to cross their property. To get to the trailhead drive either south on Highway 141 for 22 miles from Gateway, Colorado or 29 miles north from Naturita. The turnoff is on the west side of the highway at about mile marker 89.2. After parking head up the double track on the right. After passing through the gate the road bends around and begins climbing the side of the hill back toward the other direction. Near the 3/4 mile point there are some nice views looking down into the canyon. The trail reaches a fence that it follows until it comes to a ridge. There is another gate in the fence but rather than go through it stay on the east side of it and head toward the ridge. At the ridge the trail follows a faint single track around the south side of the cliff. The trail leads to a long overhang where the pictographs are stretched out from one end to the other. The first petroglyphs look like they may have been painted at one time. We highlighted some of them on the computer to make them stand out. 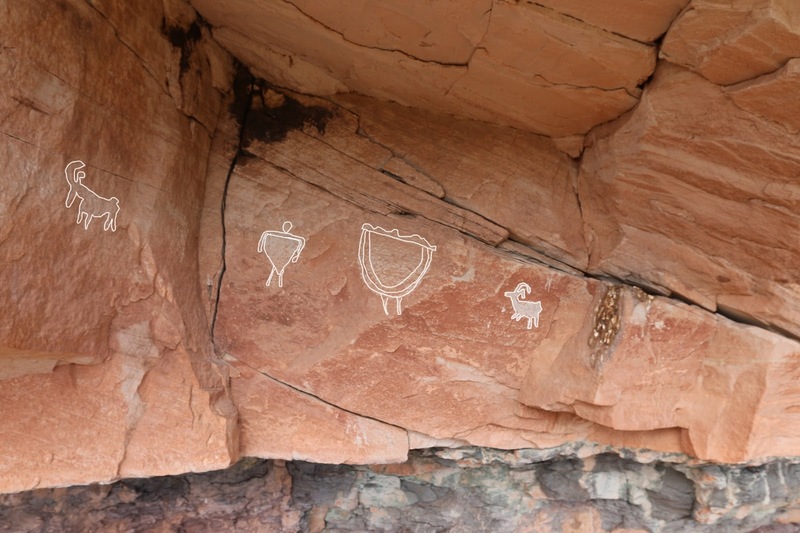 It appears that there are at least 3 different styles of petroglyphs which might indicate that the site was used by several peoples over a long period of time. Be sure to glance down at the large rocks that are on the ground to see some petroglyphs that are somewhat unique. If you zoom in on this photo you might notice that these images aren't pecked into the rock like most petroglyphs but appear to have been overlaid upon it. The Roc Creek Petroglyph site is well worth a visit for those that are interested in Native American rock art. If we obtain more information about the trespass/no trespass aspect of the trail we will update this post with it. 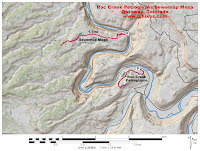 For the time being we suggest printing out the webpage with the statement (The trail near the stackyard is on private property and the Bureau of Land Management has obtained access approval from the landowner. Please respect private property.) from the West End Trail Alliance website and taking it with you. While we were there taking the photos for this post we did see several sets of footprints from other visitors. If you would like to see it for yourself then all you have to do is 'Take a hike'.